TV Antenna for the Dallas TX Area. With our 6 years of consumer feedback from our hundreds of Dallas, TX customers we have found the best TV Antennas to Receive Free Broadcast TV in the entire Dallas Texas Area. 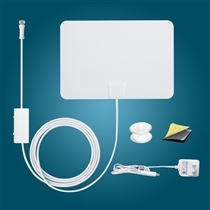 For many Residents in Dallas an Indoor TV Antenna will receive most of the available TV signals. If your house is made of stucco, brick, metal or concrete than indoor antennas will not work well. Although, if you are able, an outdoor tv antenna will receive stronger signal strength, more channels and be able to deliver signal to multiple TV's. For the overall best tv experience we recommend an outdoor TV Antenna. You can also tie into your homes existing coaxial cable and operate multiple TVs with just one Outdoor TV Antenna. The Best TV Antennas for the Dallas, TX area are listed below.